Gas exchange and transport are critical to homeostasis. As mentioned previously, respiration includes not only the exchange of gases in the lungs, but also the exchange of gases in the tissues. Recall that diffusion is the movement of molecules from the area of higher concentration to the area of lower concentration. The principles of diffusion alone govern whether oxygen (O2) or carbon dioxide (CO2) enters or leaves the blood in the lungs and in the tissues. External respiration is the exchange of gases in the lungs. Specifically, during external respiration, gases are exchanged between the air in the alveoli and the blood in the pulmonary capillaries. Blood that enters the pulmonary capillaries is dark maroon because it is relatively O2-poor. Once inspiration has occurred, the alveoli have a higher concentration of O2 than does blood entering the lungs. Therefore, O2 diffuses from the alveoli into the blood. The reverse is true of CO2. The alveoli have a lower concentration of CO2 than does blood entering the lungs. Therefore, CO2 diffuses out of the blood into the alveoli. This CO2 exits the body during expiration. Another way to explain gas exchange in the lungs is to consider the partial pressure of the gases involved. Gases exert pressure, and the amount of pressure each gas exerts is its partial pressure, symbolized as PO2 and PCO2. Alveolar air has a much higher PO2 than does blood. Therefore, O2 diffuses into the blood from the alveoli. The pressure pattern is the reverse for CO2. Blood entering the pulmonary capillaries has a higher PCO2 than the air in the alveoli. Therefore, CO2 diffuses out of the blood into the alveoli. Internal respiration refers to the exchange of gases in the tissues. Specifically, during internal respiration, gases are exchanged between the blood in systemic capillaries and the tissue fluid. Blood that enters the systemic capillaries is a bright red color because the blood is O2-rich. Tissue fluid, on the other hand, has a low concentration of O2. Why? Because the cells are continually consuming O2 during cellular respiration. Therefore, O2 diffuses from the blood into the tissue fluid. Tissue fluid has a higher concentration of CO2 than does the blood entering the tissues. Why? Because CO2 is an end product of cellular respiration. Therefore, CO2 diffuses from the tissue fluid into the blood. Figure 14.9 summarizes our discussion of gas exchange in the lungs and tissues and shows the differences in O2 and CO2 that lead to diffusion of these gases. Again, we can explain exchange in the tissues by considering the partial pressure of the gases involved. In this case, oxygen diffuses out of the blood into the tissues because the PO2 in tissue fluid is lower than that of the blood. And the carbon dioxide diffuses into the blood from the tissues because the PCO2 in tissue fluid is higher than that of the blood. Figure 14.9 External and internal respiration. 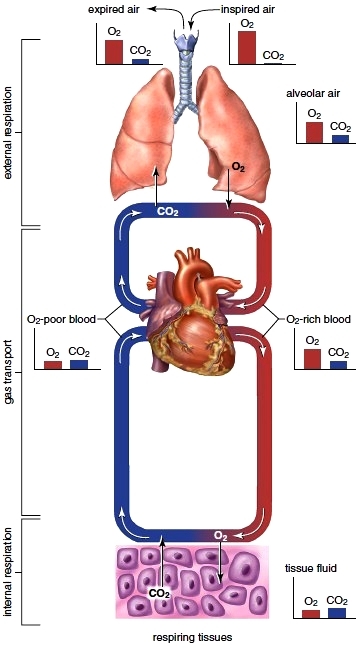 During external respiration in the lungs, CO2 leaves the blood and O2 enters the blood passively by diffusion. During internal respiration in the tissues, O2 leaves the blood and CO2 enters the blood passively by diffusion. The mode of transport of oxygen and carbon dioxide in the blood differs, although red blood cells are involved in transporting both of these gases. 1. A small amount is taken up by hemoglobin, forming carbaminohemoglobin. 2. Most of the CO2 combines with water, forming carbonic acid (H2CO3). The carbonic acid dissociates to hydrogen ions (H+) and bicarbonate ions (HCO3-). The release of these hydrogen ions explains why the blood in systemic capillaries has a lower pH than the blood in pulmonary capillaries. 3. The difference in pH is slight because the globin portion of hemoglobin combines with excess hydrogen ions and becomes reduced hemoglobin (HHb).